A touch north of Square One in mid-town, The Wilcox has consistently been a go-to hotspot by blending fabulous food and drink with an exciting atmosphere, both inside and out. World famous celebrity chef Massimo Capra’s casual modern urban restaurant on the south side of town boasts his mouthwatering recipes and stellar service levels. Does Chef Capra’s food taste even better outdoors? Maybe…but you should double check for yourself. 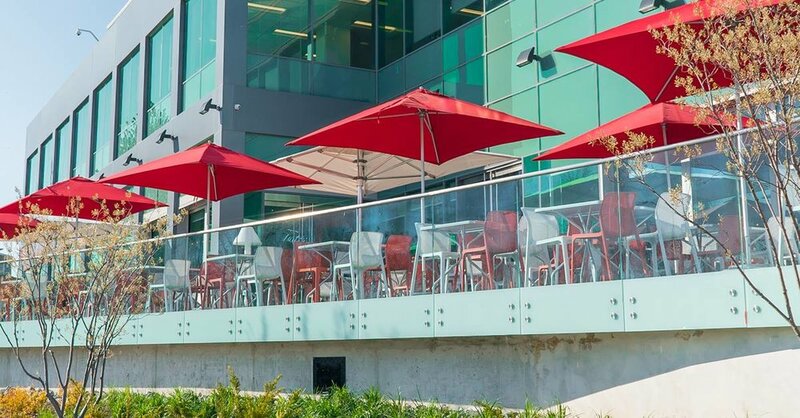 With one of the city’s biggest patios, Posta is making a huge impact on our local dining scene with their dishes and drinks being splashed all over social media. There’s nothing quite like a view of the water as you enjoy authentic, fresh Italian fare. This west-side gem not only has one of the best wings and live music in town, they’ve got an attractive patio that lets you enjoy the aforementioned outdoors. They’re also easy to get to, regardless from where you live in the city. This traditional Irish Pub in the heart of Streetsville gives you a front seat to the quaint main street as you enjoy wonderful Irish fare and cool drinks on hot summer days. Hard to pronounce, easy to find and enjoy, Cuchulainn’s is a classic choice for outdoor eats. Alioli has an absolutely gorgeous patio where you can dine on the finest in contemporary Italian cuisine in the heart of Mississauga. While the dining is fine, they’re quite approachable and if you want to enjoy a gorgeous patio with equally wonderful food, this is a must-visit spot.